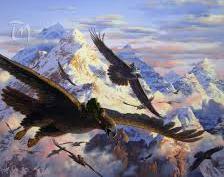 In this piece over on io9, Gibbelins discusses why Tolkien knew exactly what he was doing when he was using the Eagles of Manwë. It’s a bit sweary at times, so if you’re put off by strong language this is probably not the article for you. Good, thoughtful writing though. “The only way he knows how to resolve conflict is with those damn Eagles,” is one of the most persistent complaints about Tolkien. “They’re such a deus ex machina,” the complainer will add if he wants to make it absolutely clear that he went to college. The consolation of fairy stories…the sudden joyous “turn” (for there is no true end to any fairy tale): this joy, which is one of the things which fairy stories can produce supremely well, is not essentially “escapist,” nor “fugitive.” In its fairy-tale or otherworld setting, it is a sudden and miraculous grace: never to be counted on to recur. It does not deny the existence of dyscatastrophe, of sorrow and failure: the possibility of these is necessary to the joy of deliverance; it denies (in the face of much evidence, if you will) universal final defeat and in so far is evangelium, giving a fleeting glimpse of Joy, Joy beyond the walls of the world, poignant as grief.